The most distant galaxy cluster ever has been discovered by combining data from NASA's Chandra X-ray Observatory and optical and infrared telescopes. 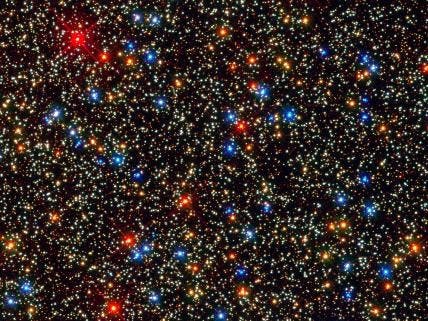 The cluster is located about 10.2 billion light years away, beats the previous record holder by about a billion light years and is observed as it was when the Universe was only about a quarter of its present age. The ancient clusrer, JKCS041, is found at the cusp of when scientists think galaxy clusters can exist in the early Universe based on how long it should take for them to assemble. Therefore, studying its characteristics – such as composition, mass, and temperature – will reveal more about how the Universe took shape. Distant galaxy clusters are often detected first with optical and infrared observations that reveal their component galaxies dominated by old, red stars. JKCS041 was originally detected in 2006 in a survey from the United Kingdom Infrared Telescope. The distance to the cluster was then determined from optical and infrared observations from UKIRT, the Canada-France-Hawaii telescope in Hawaii and NASA's Spitzer Space Telescope. Infrared observations are important because the optical light from the galaxies at large distances is shifted into infrared wavelengths because of the expansion of the universe. Casey Kazan from Chandra documents.